On the eve of the Battle of Rosebud, June 17th, 1876, the Cheyenne and Sioux received word by their scouts that General Crook was camped at Rosebud creek. That same evening the warriors readied their war horses and prepared themselves under the leadership of Crazy Horse, White Shield, Little Hawk and others.Upon preparation, Spotted Wolf a Cheyenne veteran of wars painted a kingfisher on the shoulder of his son, Spotted Horse’s. White Shield was given instructions of how to fight on the left side of the enemy. Hundreds of Cheyenne and Sioux left in the dark up the creek for a dawn attack on Crook’s command. 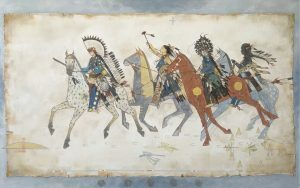 The painting depicts this incident in Ledger Art form. White Shield rides in front of the war party, his horse prancing and throwing dust, ready to attack as soon as it became light. His party consists of his most trusted warrior brothers, bonded to protect and save each others lives. Each is empowered with his own medicine, regalia and charms. A fifth blue rider is present in spirit form. -The Sun symbol to the left signifies the coming of dawn as the warriors grew anxious of the attack. -Above the riders is the morning star (Venus). -The two dragonflies Blue and Yellow represent power and agility. -On the right hand corner is the dream of Sitting Bull. A Sundance camp, the center pole, sage and a feather of prayer. -Lastly the pipe and tobacco bag of Sitting Bull. Both parties fought throughout the day. Crook called it a loss and returning to Sheridan.